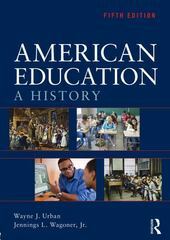 American Education 5 Edition American Education: A History, 5e is a comprehensive, highly-regarded history of American education from pre-colonial times to the present. Chronologically organized, it provides an objective overview of each major period in the development of American education, setting the discussion against the broader backdrop of national and world events. The first text to explore Native American traditions (including education) prior to colonization, it also offers strong, ongoing coverage of minorities and women. New to this much-anticipated fifth edition is substantial expanded attention to the discussions of Native American education to reflect recent scholarship, the discussion of teachers and teacher leaders, and the educational developments and controversies of the 21st century.